San Diego, Jan. 31, 2019 /PRNewswire/ - Cibus, a leader in advanced plant-breeding technologies, today announced the launch of its new seed brand, Falco™, offering North American canola growers four new canola varieties for the 2019 growing season, with additional varieties planned for next season. "We've always been influenced by nature — its speed and agility — and the Falco™ brand embodies that duality, our commitment to rapid innovation with solutions inspired by the natural world," says Dr. David Sippell, Vice President and General Manager for Canola at Cibus™. 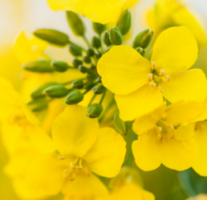 "The launch of four high-performing varieties with a proven herbicide tolerance system, signifies our commitment to providing choice and change to North American canola growers. Our Rapid Trait Develop System, or RTDS™, combined with our advanced breeding programs enable Cibus to bring many exciting products and valuable traits to growers in the coming seasons." Cibus Co-Founder and Chief Executive Officer Peter Beetham, Ph.D., added: "Cibus plans to launch multiple stacked traits in its Falco seed during the next several years, including pod-shatter shatter tolerance, tolerance to multiple herbicides and resistance to disease." Through relationships Cibus has established with North American grain crushers, canola growers have the opportunity sell their Falco grain via premium contracts in Canada and the U.S. Varieties available for the 2019 growing season include 68K in both Canada and the U.S., in addition to 32K and 40K in the U.S. All varieties offer sulfonylurea herbicide tolerance and premium contract opportunities through preferred partners. Those interested in learning more about Falco™ can visit falcoseed.ca in Canada, or falcoseed.com in the U.S.
Cibus is a biotechnology company using advanced technologies to develop desirable plant traits for the global seed industry by precisely editing a plant's genes without the integration of foreign genetic material. This technique accelerates natural breeding that has been a staple of farming for thousands of years and has been classified in certain key agricultural markets as not subject to GMO regulation. Cibus has launched its first commercial canola products, now marketed under the Falco™ brand, and is developing a pipeline of beneficial traits in other crops that it plans to license, including healthier oil quality, disease resistance, and herbicide tolerance. Cibus has established crop platforms in canola, rice, flax, potato, and is now developing platforms in wheat, corn, soybean and peanut. The broad applicability of Cibus' technologies is highlighted by its Nucelis division, which extends the company's trait development program to microorganisms, including yeast, bacteria and algae, for the food, flavor and fragrance and personal care markets. The company has subsidiaries in Europe and North America and a state-of-the-art research and development center in San Diego.